You know that your team performs ok, but you also know that if they were to improve some of their skills, they could achieve even more. You just don’t know where to start. A training Needs Analysis is the answer. The objective of the Training Needs Analysis is to identify the needs of your people. By understanding the gaps in performance of your people versus the KPIs & objectives of the business, we can begin working together to close those gaps and improve performance. 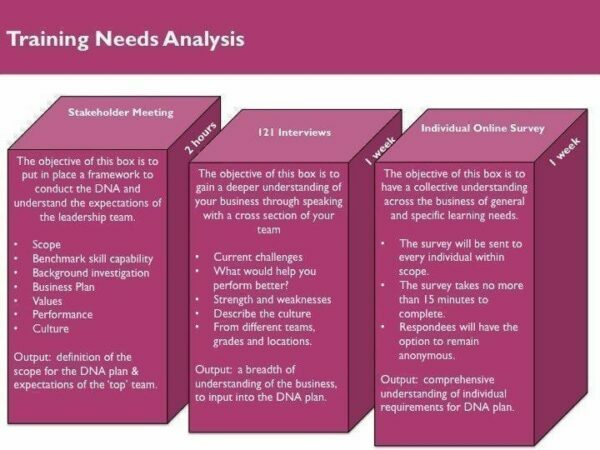 There are 3 parts to achieving a successful Training Needs Analysis, sometimes called a Learning Needs Analysis (LNA): Stakeholder Meeting, One-to-One Interviews, and an Online Survey. The output of the Stakeholder Meetings is an understanding of the company’s goals, the expectations of the leadership from their people and an approach to achieve parts 2 and 3. Current challenges at work and with skills using our competency frameworks. What would help you perform better? Ensuring we cover different teams, grades and locations. The output is a breadth of understanding of the business, general development needs and attitudes towards a people development programme. The objective of the Online Survey is to gain a collective understanding across the business of general and specific development needs. The survey will be sent to every individual within scope. The survey will take no more than 15 minutes to complete and respondees will have the option to remain anonymous. This normally takes 1 week to complete, from request to completion by respondees and then summarising. The output is a comprehensive understanding of individual development requirements. Each Training Needs Analysis is carried-out with no obligation by the client to purchase the recommendations. The TNA requires an investment of £750+vat and is limited to 3 Training Needs Analysis per year for MBM due to the costs involved for SMEs.